The last decades, Third Party Ship Management Companies have started to play an important role in the shipping industry. Specially, right after the economic downturn and the decline of the freight rates, ship owners are trying to reduce their costs and run their vessels more efficiently. As a result more and more ship owners turn to the solution of a Third Party Ship Management Company running their vessels. However, the relationship between the ship manager and the ship owner is not always ideal. Disputes between them may arise, regarding claims from third parties, standards and the quality of the vessel, bad performance of the vessel, delayed payments, etc. The aim of this thesis is to define the duties and obligations of each of the two parties involved, what are the risks that are undertaken and how can they be covered reducing the risk of future disputes or claims. 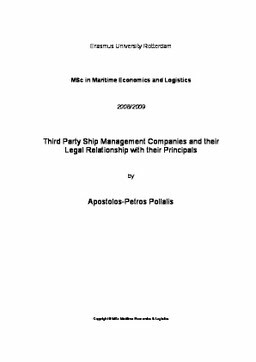 In order to come up with some useful outcomes, the contracts that are used by the parties for ship management agreements are investigated, additional to previous cases of disputes that have ended up in the courts of law. At the end of the research, an effort for meaningful suggestions and proposals regarding the legal relationship that should be bonding the parties involved in a ship management agreement is made.